Some economists argue that the efforts now underway to reduce government spending as a share of GDP will have adverse effects on unemployment. This is not what the data show. Consider this chart which shows the pattern of government purchases as a share of GDP and the unemployment rate over the past two decades. (The data are quarterly seasonally adjusted from 1990Q1 to 2010Q3.) There is no indication that lower government purchases increase unemployment; in fact we see the opposite, and a time-series regression analysis to detect timing shows that the correlation is not due to any reverse causation from high unemployment to more government purchases. In sharp contrast, the data on spending shares show that the most effective way to reduce unemployment is to raise investment as a share of GDP. The second chart shows the relation between unemployment and fixed investment over the past two decades. Higher shares of investment are associated with lower unemployment. The time series in the third chart show the relationship from another perspective. 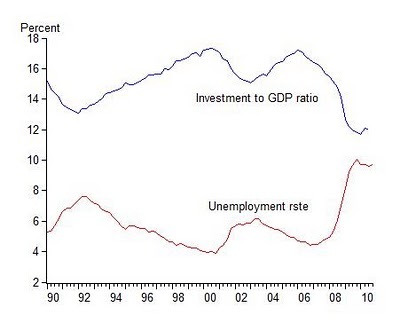 Either way you look at it, the relationship between unemployment and the investment share is remarkably close. It holds for both non-residential and residential investment, and is a subject of my current research. Of the four shares of GDP (the other two of course being consumption and net exports), the investment share shows by far the largest negative association with unemployment. Encouraging the creation and expansion of businesses should be the focus on government efforts to reduce unemployment. The recent compromise agreement to prevent the increase in tax rates on small businesses and the move to lighten up on the anti-business sentiment coming out of Washington are two steps in the right direction.